I’ve been wanting to do a Wonderful Blogger Award but awards are very time consuming and are difficult for me, but writing about Wonderful is a lot easier. And I could even write about Wonderful Bloggers I’ve discovered as I’ve wandered Blog World. Write a poem, a post, or pretty much anything that is Wonderful to you and share it. Look for the Post Wednesday just after midnight EST. That’s New York City time for people like me that don’t know. And if there aren’t many that post, or no one at all, my post about Wonderful will still be here. Regardless, Tweet your post with the hashtag #BeWoW and as soon as I wake up, I will start RT everything positive I see. You do the same. Share! This is the badge you can use if you like to put in your post and/or your sidebar. My side bar I found that 210×210 pixels is as large as it goes and shows everything. Why is there a copyright in the picture? My son “B” and I took the picture. He did blew the Bubbles while I was on the grown looking up at the sky. He loved popping it and splashing me with the water. Hey, I thought it was a good idea at the time. At least he laughed. And that’ why I chose it as the Wonderful image. 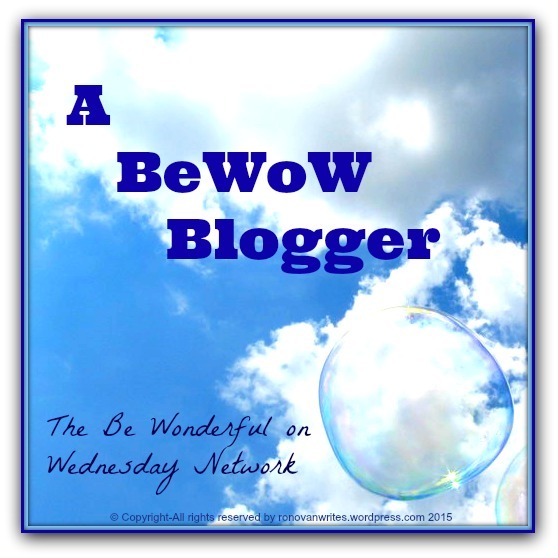 Share that link from your blog here in the Wednesday BeWoW post I put out after midnight Wednesday EST. That way others that drop by here can go check you out if they like. When you share your post on Twitter use the hashtag #BeWoW, which I have registered and am the administrator of, on Wednesdays. We can all ReTweet what we see and like. You can include my twitter handle of @RonovanWrites in your Tweet and I will try to RT everything I see that is positive. Please don’t use this for anything but positive things. I do hope you join in and BeWoW every day. I did a thing on hashtags.org to define it but not sure about registering. It has now been registered. Just a wee bit confused… are we posting on our own blogs, or on yours for BeWOW? Sounds intriguing, I’m always up for happy stuff. You post on yours, but then copy a link in the comments of mine for that day so anyone visiting here can go visit you. Also when you tweet use #BeWow. I just registered the hashtag and I am the administrator of it. I’ll reword the article to better explain it. What happens if I can’t wait until Wednesday? You can post anyway. And Tweet it with the hashtag and my twitter handle of @RonovanWrites and I will be certain to RT it to all of my followers. That’s a great idea! I had no idea you had to register a hashtags. Well, you don’t HAVE to. But to keep this one for what I want it to be it was thought to be a good idea. And thank you for liking it. 🙂 I have ideas at times. I have to move on them quick or I forget. Now I have to remember it. Challenge! Wonderful and positive? Most of my stuff is usually ugly and negative, but might have to give it a go….think positive, think positive, think positive…. I am positive you can do this. I think. o,O Um, yeah, Positive. I just love Ronovan’s A BeWow Blogger for us to share some positive things in our life. We need more of these stories. I hope you all will join in. Reblogged this and I hope to participate at http://WWW.Wyswoods.worpress.com. I am still not sure what the pingback comes into play. Great idea, I am totally in.. Saw this on a Thursday, would be ready for the next #BeWoW.